These OPM greats still know how to keep us on the edge of our seats! Many left the Newport Performing Arts Theater last February 9th with smiles on their faces, as Ely Buendia and The Itchyworms had once again worked their magic, performing their greatest hits to an audience of almost 2,000 people. The whole NPAT came to life as the opening chords of "Alapaap" broke the silence, slowly revealing Ely in the spotlight. As he began to sing, the stage lit up with a moving image of rolling clouds and blue skies, revealing The Itchyworms in their intricate band set up. There they were in the center of what looked like a basketball court, with a sari-sari store and burger join in the backdrop--stage props for the theatrical production of "Ang Huling El Bimbo The Musical." And to top it all off, the actual cast of the Eraserheads-inspired play could be seen hanging out and singing along in the background, creating a more relaxed feel to it. After the first hit came a flawless line-up of both The Itchyworms' and the Eraserheads' most beloved songs, including "Penge Naman Ako Nyan," "Magasin," "Lutang," "Gusto Ko Lamang," "Torpedo," and "Buwan." At one point, Jugs and the rest of the group asked the audience to check under their seats for a "golden ticket," which entited a total of 15 lucky audience members to join Ely and The Itchyworms onstage. Once seated in a set of risers, the band began to play E-heads classic, "Kailan." And then--BLACKOUT. The whole venue was engulfed in darkness just as the show was picking up. And as the technical crew "worked" on getting the lights back on, what the audience didn't know was that it was another set up for a big reveal: the addition of former Eraserheads lead guitarist, Marcus Adoro. 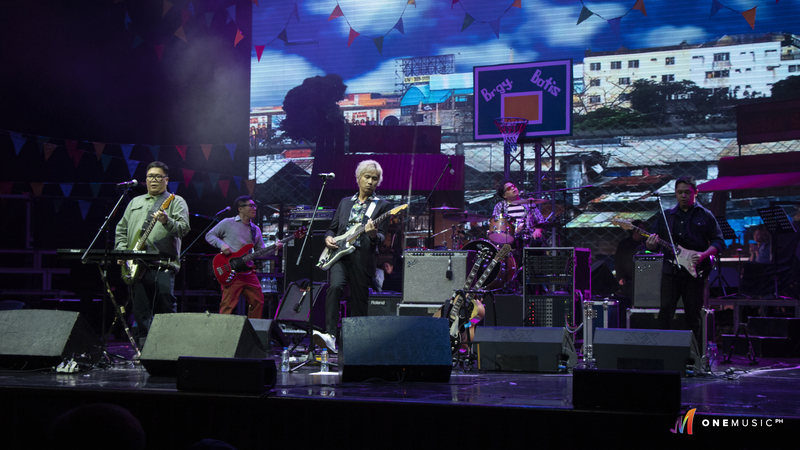 As they moved closer to the section with the golden ticket winners, Ely, Marcus, and The Itchyworms performed an acoustic set of the interrupted "Kailan," much to the delight of E-heads fans present. They continued their acoustice set with "Minsan" and "With A Smile," to which the crowd slowly accompanied with a wave of lights. Following the intimate set, the group went back to their original positions ready to rock out with the accompaniment of the AMP ensemble. They continued with Marcus on vocals for a reggae version of "Huwag Mo Nang Itanong," and a rousing tribute to the late OPM rock legend that is Pepe Smith, who was very close with Marcus, Ely, and the Itchyworms. The rest of the night was a collection of non-stop hits, starting with "Ayokong Tumanda," followed by "Love Team," "Spolarium," "Beer," "Overdrive," and "Akin Ka Nalang." And yet they offered another treat for the senses, as Ely Buendia sang The Itchyworms' "'Di Na Muli," alongside Jazz. They then performed the song that started this whole collaboration in the first place. Not many people know that the group worked on one of Ely's unfinished songs from the 90's. And as the story goes, he liked how Jugs had finished it. So in 2006, Ely Buendia and The Itchyworms released "Pariwara." To end the night of nostalgia, the group performed "Ang Huling El Bimbo." Here's a snippet of that magical moment. Of course, the audience clamored for more, not wanting the night to end. So the men of the hour came back onstage to perform a medley of "Balikbayan" and "Pare Ko" until the curtains made their final descent. With a series of well-planned theatrics, stunning visuals, seemless transitions, and huge bouts of nostalgia, Ely Buendia and The Itchyworms: Greatest Hits was no ordinary concert; it was a massive celebration of the iconic music and friendship shared by Ely Buendia, Jazz Nicolas, Jugs Jugueta, Kelvin Yu, and Chino Singson from almost 20 years ago. Special thanks to Resorts World Manila for inviting us to the show! What are your favorite songs by The Itchyworms and Eraserheads? Should they do a part 2? Comment below! AC Bonifacio and Lavaado bring us the #InAndOutChallenge! Ebe Dancel to Ben&Ben: "Can i be your front act"